Yes, this Creamy Dreamy Strawberry Smoothie is non-dairy and non-soy, but tastes so creamy you’d never know it. I am a sucker for a creamy smoothie, especially where strawberries are involved, and I need my smoothie to pack a nutritional punch. This strawberry smoothie really kills it on all angles. I use pure natural maple syrup as a sweetener as it tastes awesome. I get a little excited when I think about this baby because it is my decadent delicious smoothie dream come to life and is filled with nutrients. The soaked cashew nuts really ramp up the creaminess levels. To get maximum nutrients from the cashew nuts and to make them more digestible and soft,I soak the cashews for 4 hours first, then rinse them well. I then throw them in the blender with 3/4 cup filtered water, toss in the rest of the ingredients for the smoothie and blend. It really is that easy. One of the best things about this smoothie, besides the fantastic flavor, is the nutritional content. This baby is packed with Vitamin C, and about 30% of your daily magnesium, manganese and phosphorus requirements. It also contains a good amount of copper, selenium, vitamin B6 and vitamin K. The golden flax seed flakes give it a whopping boost of omega 3, fibre and protein. It is a great meal replacement if you want to load up on vitamins and minerals. It also keeps you satisfied. 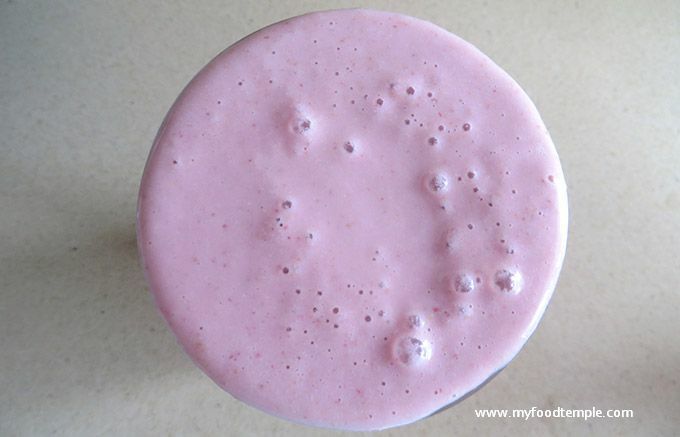 You won’t feel like eating for a while after this creamy nutrient stacked smoothie – love it, love it, love it! Just search golden flax seed flakes in your area to work out where to get them. I find them in the major supermarkets. Throw all ingredients into a blender and blend. Keep blending until mixture is smooth and turns to a nice soft pink colour. It is important that you pre-soak the cashew nuts for 4 hours (or overnight or all day), then rinse them well before using, as it will make them easier to digest and it will make the smoothie much creamier and a much lighter colour. Soaking the cashews removes the gritty texture and makes them creamy and smooth. Soaking also improves digestibility of the nuts. Finally, the creaminess from soaking also makes the smoothie a beautiful pastel pink colour, instead of dark pink and it tastes amazing.